Recycling in Derby is under attack by the city council who are now wedded to a waste contract spanning decades to feed a waste incineration plant under construction. The plant will require them to procure waste of set tonnage, moisture, calorific and biomass values which is at odds with the requirement to meet recycling targets such as the 50% 2020 national figure or the councils shared target with Derbyshire County Council of 55%. Having hit a high of 48% recycling in 2010/11 the council itself is predicting a fall to 33% if their recycling scheme does not improve. The removal of the free garden and food waste recycling scheme played a large part in the sudden downfall of the recycling scheme. It's replacement with a £40 charge for a part year garden waste only service led to widespread rejection and a sudden fall in the recycling rate. 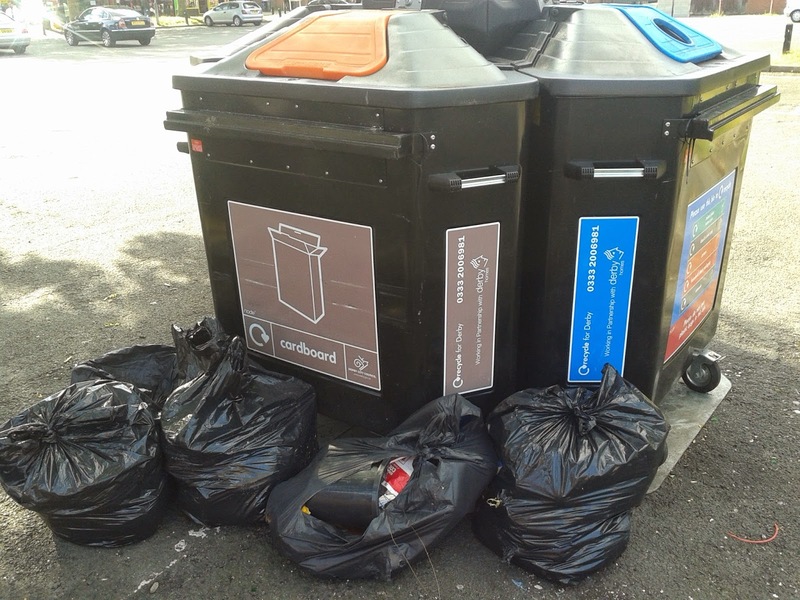 Not satisfied with that destruction applied to the councils recycling scheme in 2013 the council decided to target specific areas of the city to remove kerbside recycling while claiming this was due to contamination issues and the need to improve the street scene. Areas targeted were Arboretum, Normanton, Abbey and New Zealand (an area of Mackworth). What became clear was that the council was targeting specific streets - including my own in Normanton so it was time to start asking questions. It soon became clear having made an FOI on the subject that the council had no evidence to back their targeting of specific streets such as my own as contamination is extracted at processing time. "Tonnage data at round/street level is not available for blue bins as contamination tonnages are assessed after processing. " With that in mind I thought I might as well ask BIFFA the waste processor directly as they take in Derby blue bin material at their plant on Victory Road in Derby. Nobody is better placed to comment than the company that actually accepts the material so I spoke to Steve Norman Regional Operations Manager in September 2013 who answered with the following. Q1 Does the Biffa MRF facility in Victory Road have the need to reject incoming loads delivered in by Derby City Council due to excessively contaminated material? Answer: The site at Victory Road has not to date rejected loads delivered to it premises. On the whole the material received is of a good quality and contains very low levels of contamination. In the end kerbside recycling was removed from Arboretum with the provision of a restricted number of bring sites - which regularly attract fly tipping. By this point I had already made an FOI into blue bin contamination because I recognised it was best practice since my investigations had taken place a year earlier and things could have changed. ANSWER: None, rejects are taken out during the sorting process. The average percentage of rejected material from the start of the new blue bin collection system on June 4th 2013 to 31st March 2014 was 5.8%. It struck me that maybe I wasn't clear about the period I was interested in so I returned to the FOI dept for clarity which is shown below. In relation to question 3 - rejected loads at the BIFFA site in error I referred to 2013/14 - what I had meant was 2013 / 2014 - ie 2013 and the year 2014 to date - please advise if the answer is any different." Answer: No individual loads have ever been rejected, both in the old pre June 2013 arrangements or in the new current arrangements. All rejected materials have been and continue to be taken out as part of the sorting process. So straight from the horses mouth we have statements from the council's own FOI dept that material IS NOT rejected by its sorting contractor because the process simply sorts the wheat from the chaff so to speak. So where is the contaminated waste that causes the council so much horror that they remove swathes of kerbside recycling in the city? The answer is who knows ! the council claim when bins are contaminated they are not collected by the council and are tagged. But where are all the tagged bins ? and if the councils own FOI dept says contamination is sorted out of the recyclate which backs up statements made by BIFFA are the councils just peddling a story to remove a service without actually having the evidence to back their claims. We all are as driving recycling backwards will lead to Derby missing government targets when it is clear that the technology in place addresses the issue of contamination. Removal of the kerbside service - which cost £10 per tonne in 2013/14 and replacing it with a disposal cost of circa £118 per tonne condemns Derby residents to paying a high premium to support the service removal - the council suggest this is £30,000. Finally the people who lose the most are the residents of the streets where recycling has been removed. Residents of Balaclava Road in Normanton for example will be expected to walk a round trip of almost 1,200 metres to a bring site on Havelock Road but even worse ! they cannot even do that as at the time this blog was written the new bring site had not even been installed !